Hit the streets with some of the best Pro Players and experience all the style and attitude of street football with Fifa Street 3. Decked out in authentic training kits and street wear, every Fifa Street 3 player boasts their own, distinctive style of play with unique abilities to match. Whether you’re after brawn, brains, silky skills or crunching tackles, the perfect street team is out there. Take instant control of your heroes with Fifa Street 3's new, responsive and intuitive control system. Use the simple button configuration and analog stick to seamlessly combine moves – providing you with hundreds of different ways to show off your Fifa Street 3 skills. Fill up your all-new Game Breaker to power your ultimate abilities and express yourself like never before. Maneuver your heroes in Fifa Street 3 to leap past defenders, flip off walls, or perform gravity-defying one-timers to score spectacular goals. Set in exotic locales around the world with an eclectic selection of music seamlessly infused into the world around you, Fifa Street 3's environments pulsate, and explode to life with every well-timed tackle, outrageous trick move or unstoppable shot on goal. 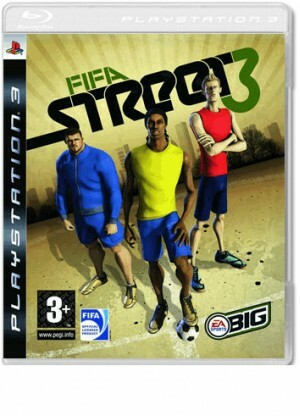 Take your football heroes to the streets and experience the revolution in street football with Fifa Street 3!